St Swithun’s body was moved to an indoor tomb. The moved was marred by 40 days of rain. Hence the saying ‘If it rains on St Swithun’s day it will rain for 40 days’. Edgar and his wife Aelfthryth were crowned at Bath by Dunstan, Archbishop of Canterbury. This coronation is thought to have been a second coronation to mark the zenith of Edgar’s kingship. The service was devised by Dunstan and elements of it are still used for monarch’s coronations today. The dowager Queen and many leading nobles did not support the accession of Edward, Edgar’s son from his first marriage. They believed that Aethelred, Edgar’s son from his marriage to Elgiva should be King. Edward was murdered at Corfe Castle by assassins acting on behalf of the dowager Queen. 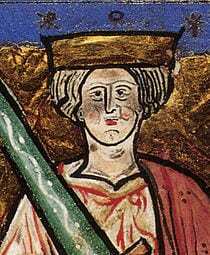 His half-brother Aethelred aged 10 years, styled Unready, became King. Aethelred the Unready was crowned King of England at Kingston upon Thames.